Trampoline parks are the fastest growing segment of the amusement industry with an increase of 700 percent over the last three years. Enterprising investor types are on the sidelines waiting to see if if the public’s interest in pay-to-jump fun will continue to soar or drop with a thud. Smart investors know they can’t determine long-term profitability only by the long waiting lines to get into these parks, popularity of kids’ trampoline parties, and growing interest in trampoline fitness workouts. Injury and liability risks are also a serious factor. There are currently no mandatory national industry safety standards, and so far only Arizona and Michigan have passed regulation legislation. ASTM International, the globally recognized leader in the development of standards for testing and materials, recently published its ASTM F2970-13standard. However, these standards are only voluntary at this time. Some of the franchised trampoline park companies have created a task force to establish uniform safety standards. 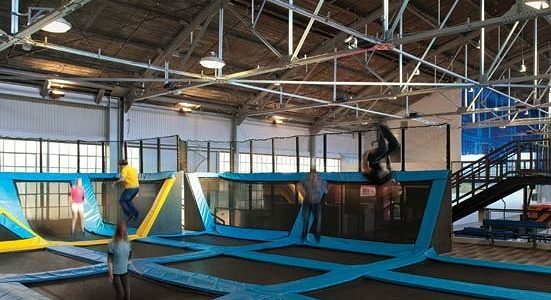 It’s common practice among trampoline parks to have guests review the safety rules and sign a waiver before jumping, have those rules posted, and station staff around every jump zone to ensure everyone follows the rules and assist jumpers when necessary. But not all parks employ best practices, such as emergency medical training for employees, setting limits on number of jumpers, or age/size limits of jumpers. The start-up cost of a new park can run $750,000 to $2 million. That can get paid off fairly quickly with average fee of $10 per half hour of jump time and revenue from trampoline parties and other events, including adult trampoline basketball and trampoline aerobics classes. However, maintaining the park and keeping it safe and well-staffed could cut into profits. The insurance fees park owners pay can be 6 to 7 percent of their gross revenues. Some of the larger franchise operators have arranged group insurance programs for their franchisees. If you want more information on trampoline parks or are a trampoline park operator looking for insurance, call Sadler Sports and Recreation and Insurance at (800) 622-7370. Source: Joan Verson, NewJersey.com, 27 June, 2014.